How Risky Is Sierra Wireless Inc. (USA) Stock? Should you buy this “pure play” on the Internet of Things at multi-year lows? Sierra Wireless (NASDAQ:SWIR) is often called a "pure play" on the Internet of Things (IoT), which connects various gadgets to each other and the cloud. Sierra is the world's largest manufacturer of 2G, 3G, and 4G LTE embedded modules and gateways for those devices, and the stock almost hit $50 per share in late 2014 on rising expectations for the IoT market. However, the stock has since fallen to around $14 due to sluggish sales growth, weak enterprise spending, a temporary shortage in RF components, and rising competition. Is the stock a safe contrarian play at these multi-year lows, or does it still have room to fall? How fast is Sierra Wireless growing? A look at Sierra's year-over-year sales growth reveals why investors aren't too confident in the company's prospects. Data source: Sierra Wireless quarterly reports. During the second quarter, revenue from OEM Solutions, its largest business, fell 4% to $138.2 million. The smaller Enterprise Solutions and Cloud & Connectivity Services units both posted double-digit sales growth. For the current quarter, Sierra expects flat to negative 6% sales growth, due to "softer short term demand and tighter inventory management" with some established customers. However, that forecast notably excludes potential contributions from its recent acquisition of GenX Mobile, a provider of in-vehicle cellular devices for the fleet management, asset tracking, and transportation markets. That unit, which generated $6.7 million in revenue in the first half of the year, might help Sierra top weak expectations. After all, fleet management has been such a hot market that Verizon (NYSE:VZ) recently acquired two companies in the space -- Telogis and Fleetmatics (NYSE:FLTX) -- within the past two months. Sierra also believes that it remains "well positioned to drive strong long term growth" in the IoT market. Cisco forecasts that the number of connected devices worldwide will double from 25 billion in 2015 to 50 billion in 2020, so Sierra's slowdown could certainly be temporary. Nonetheless, Sierra still expects its full-year revenue to come in "below the low end" of its prior guidance for 4% to 10% growth -- which compares poorly to 11% growth in 2015 and 24% growth in 2014. How profitable is Sierra Wireless? Sierra's top line declines are disappointing, but its bottom line declines look worse. Last quarter, Sierra's GAAP net income plunged 83% year-over-year to just $0.7 million. That drop was mainly attributed to a big jump in amortization expenses from acquisitions. On a non-GAAP basis -- which excludes those costs, stock-based compensation, and other expenses -- earnings still fell 26% to $6.4 million. Sierra's gross margin improved 150 basis points annually to 33.8%, but that gain was inflated by the reimbursement of legal expenses from a contract dispute. Operating expenses still rose by both non-GAAP and GAAP measures due to higher marketing and acquisition-related costs, but the RF component shortage last year -- which boosted costs of goods sold as Sierra redesigned products with pricier replacements --- is now in the rear view mirror. Looking ahead, Sierra expects its non-GAAP EPS to fall 43%-74% for the current quarter and decline more than 25% for the full year. Is Sierra's cash flow stable? Sierra's slowing sales and earnings growth -- combined with its acquisitions of AnyData, In Motion Technology, Wireless Maingate, Accel Networks, and GenX over the past three years -- have taken a bite out of its cash reserves. 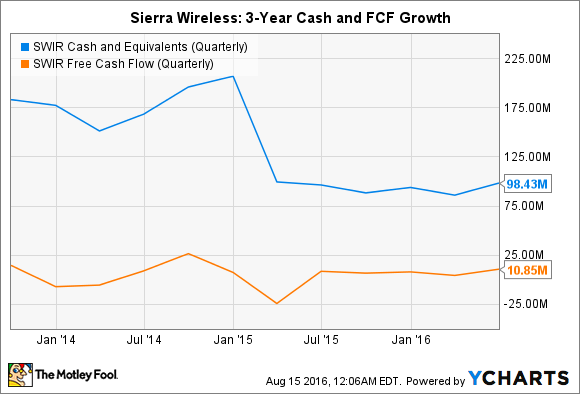 However, both Sierra's cash and free cash flow levels have held steady over the past year, and the company remains debt-free. This indicates that Sierra exercises cautious cost controls, and that it can continue growing inorganically to expand its IoT footprint and offset top line declines. If cash levels fall but interest rates remain low, it can take on debt to keep expanding. Sierra Wireless' future might look murky, but I believe that its price-sales ratio of 0.8 and enterprise value-sales ratio of 0.6 will limit its downside potential, even if sales keep declining in the near term. Therefore, I don't think Sierra is a risky play at current prices, and its stable cash flow and clean balance sheet should soften the blow of its top and bottom line declines -- as long as they eventually recover. So if you're a patient investor who can stomach some near-term volatility, I believe that Sierra's long-term rewards should outweigh the near-term risks.